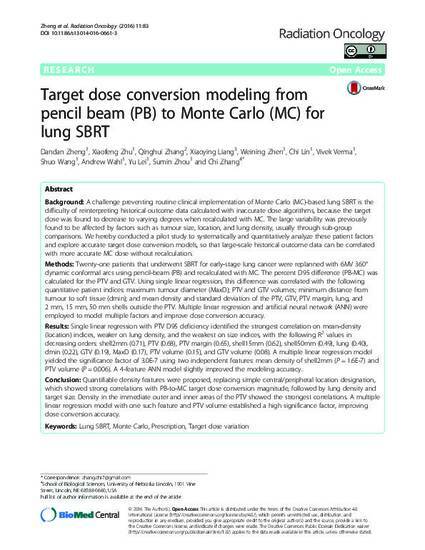 Background: A challenge preventing routine clinical implementation of Monte Carlo (MC)-based lung SBRT is the difficulty of reinterpreting historical outcome data calculated with inaccurate dose algorithms, because the target dose was found to decrease to varying degrees when recalculated with MC. The large variability was previously found to be affected by factors such as tumour size, location, and lung density, usually through sub-group comparisons. We hereby conducted a pilot study to systematically and quantitatively analyze these patient factors and explore accurate target dose conversion models, so that large-scale historical outcome data can be correlated with more accurate MC dose without recalculation.  Methods: Twenty-one patients that underwent SBRT for early-stage lung cancer were replanned with 6MV 360° dynamic conformal arcs using pencil-beam (PB) and recalculated with MC. The percent D95 difference (PB-MC) was calculated for the PTV and GTV. Using single linear regression, this difference was correlated with the following quantitative patient indices: maximum tumour diameter (MaxD); PTV and GTV volumes; minimum distance from tumour to soft tissue (dmin); and mean density and standard deviation of the PTV, GTV, PTV margin, lung, and 2 mm, 15 mm, 50 mm shells outside the PTV. Multiple linear regression and artificial neural network (ANN) were employed to model multiple factors and improve dose conversion accuracy. Results: Single linear regression with PTV D95 deficiency identified the strongest correlation on mean-density (location) indices, weaker on lung density, and the weakest on size indices, with the following R2 values in decreasing orders: shell2mm (0.71), PTV (0.68), PTV margin (0.65), shell15mm (0.62), shell50mm (0.49), lung (0.40), dmin (0.22), GTV (0.19), MaxD (0.17), PTV volume (0.15), and GTV volume (0.08). A multiple linear regression model yielded the significance factor of 3.0E-7 using two independent features: mean density of shell2mm (P = 1.6E-7) and PTV volume (P = 0.006). A 4-feature ANN model slightly improved the modeling accuracy. Conclusion: Quantifiable density features were proposed, replacing simple central/peripheral location designation, which showed strong correlations with PB-to-MC target dose conversion magnitude, followed by lung density and target size. Density in the immediate outer and inner areas of the PTV showed the strongest correlations. A multiple linear regression model with one such feature and PTV volume established a high significance factor, improving dose conversion accuracy.